With it being March; I decided it was time to review my goals for this year and see if I’m on track or not. One of my main goals for 2019 was to improve my self care. Self care can be defined in several different ways depending on who you ask. My definition of self care is basically doing something for YOU and your own mental, emotional and physical health and wellbeing. It can help motivate you to adopt healthy habits and take care of your physical self. It can improve your emotional health. It gives you a break from stress. It gives you time alone. It makes you a better caregiver. It improves your relationship with others in how you interact with them. It produces positive feelings and boosts your confidence. It reminds others and yourself that you and your needs are important too. I recently added Self Care Icon Planner Stickers to My Life Planners Etsy shop. It is a printable sticker sheet that will give you a list of 96 different things you can do to practice self care and keep track of it in your planners. One of the ways that I like to practice Self Care is to journal daily. 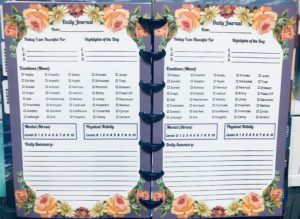 Last year I created the Prompt Journal to help me write my thoughts down. This year I’m doing something a little different. I created an insert with specific items for me to check in on my mental health and how I am feeling each day. I put a section in for gratitude because I found myself with negative thoughts and thinking of 3 things to be grateful for each day has really improved my mood each day. 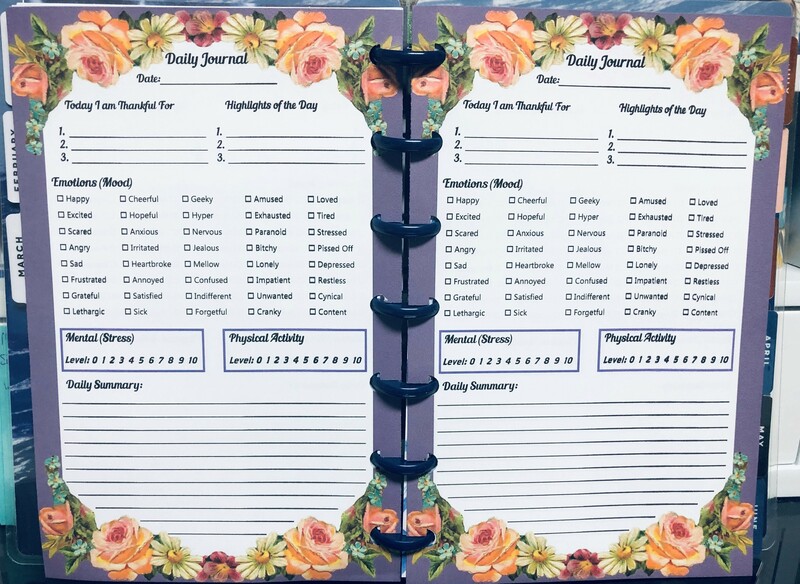 I recycled an old mini happy planner that was outdated and used the tabs to separate the months. Remember there is no right or wrong way when it comes to planning or even with self care; only what works for you. To download the Big Happy Planner size insert (BHP). Please click here. To download the Classic Happy Planner size insert (CHP). Please click here. To download the Mini Happy Planner size Insert (MHP). Please click here. Instructions for printing out your freebie Insert. Please click here.